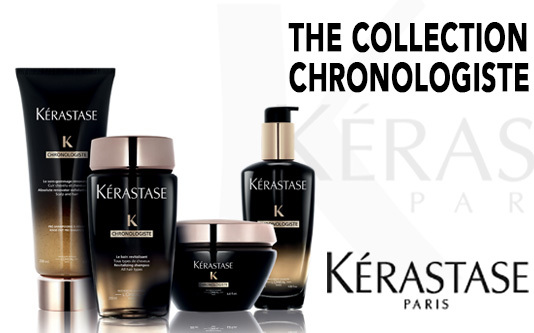 Kérastase represents the finest in luxury care for hair, setting new standards in professional haircare products distributed through selected salons, where hair is analysed in detail and the whole procp ess becomes a ritual of beauty and well-being. The Kérastase hair care collection exudes luxury and sophistication, with added highly-effective hair care formulas that give long lasting, memorable results. These products are specifically designed to cater to individual hair care needs, with a variety of product ranges that span from Resistance, products which strengthen damaged and fine hair , to Age Premium, hair products that give mature hair a new lease of life. Each product range includes carefully formulated shampoo, conditioner and hair styling products, which makes finding your very own personalised hair care programme easier than ever before. 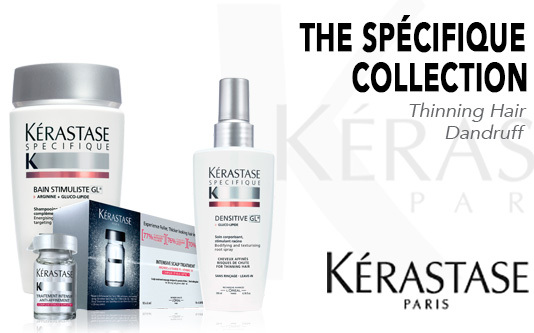 Kérastase Paris is constantly innovating thanks to the brands science-based approach to the hair and scalp. At Kérastase Paris the belief is that caring for the beauty of the scalp and the hair is just as important as caring for the beauty of the skin. Always striving to be one-step ahead, Kérastase is currently conducting continuous, high-level research to achieve the new frontier of beautiful hair. 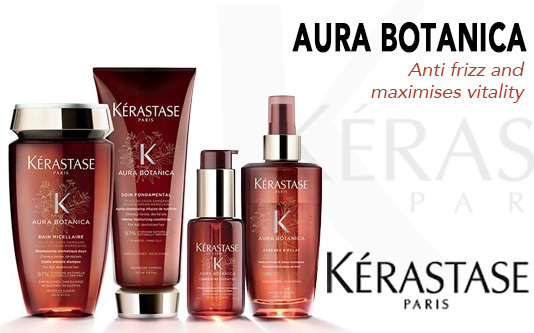 Aura Botanica ThérapisteTransform dry, dull and lifeless locks with the Kérastase Aura Botanica Fraiche Hair Oil Regime Bundle. Selected from the brand’s exquisite natural haircare collection, the trio work in tandem to tackle impurities, combat frizz and maximise vitality without stripping or drying hair. Tresses feel sumptuously soft and supple with mirror-like shine. Reinforces the internal structure of the hair while providing a natural, long lasting style memory and UV protection. 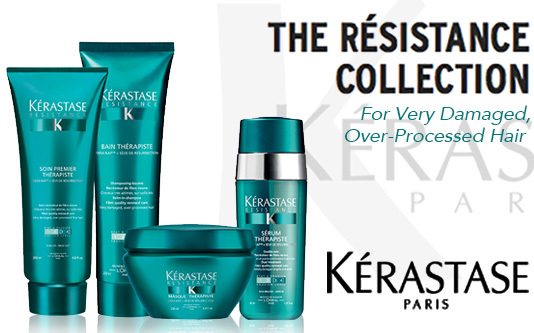 The formulas of Resistance Thérapiste are enriched with FIBRA-KAP™, a powerful complex designed to compensate for the missing KAPs in damaged hair and RESURRECTION SAP, an extract from a plant able to come back to life after 10 years of near death. Chronologiste, A unique ritual. Kérastase created a customised 4-step beauty routine: prepare, bathe, care and texturise with carefully-conceived methods for beautifying the hair. These simple steps constitute a targeted, in-salon treatment which establishes a ritual haircare routine that women can do in-home with Kérastase products. 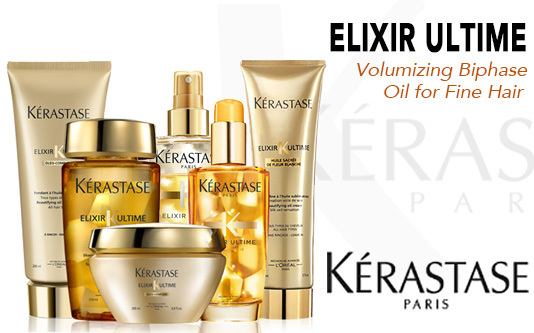 Kérastase Elixir Ultime, a premium collection with a maximum concentration of luxurious oils for richly treated hair with golden splendor, enriched with beautifying oils. Utilising four precious oils including Argan Oil, Maize Oil, Camellia Oil and Pracaxi Oil, in the Elixir Ultime formulations, hair is left looking radiant. A unique ritual. Kérastase created this customized 3-step beauty routine: cleanse, treat and texturize with carefully-conceived methods for beautifying the hair. These simple steps constitute a targeted, in-salon treatment which establishes a ritual haircare routine that women can do in-home with Kérastase products.. 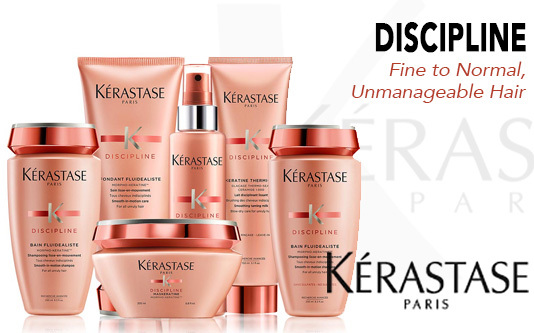 Discipline, The first collection that offers daily discipline for unruly hair without weighing it down, infusing it with fluid movement. 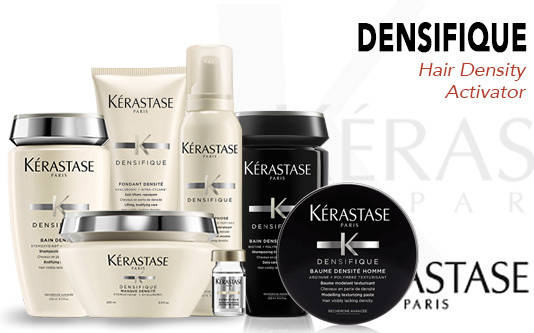 Densifique, Introducing a new era of hair genesis. For the first time*, reveal new hair and create hair substance. Densifique is a daily at-home program designed to significantly improve hair density. It contains a powerful blend of Stemoxydine ®, to encourage the growth of new hair, texturizing polymers to create an instant densifying effect that is soft to the touch and vitamins B3, B5 and B6 to help reduce hair loss, regulate sebum and strengthen the hair fibre. The program increases hair mass, resulting in healthy and full looking hair. 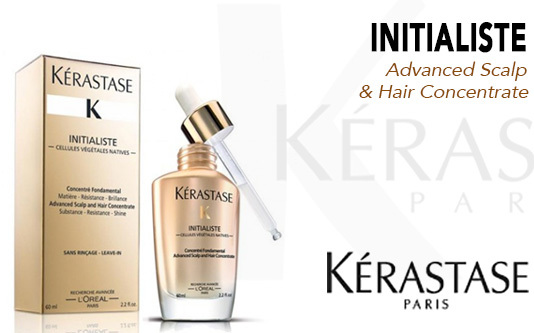 This innovative Initialiste Advanced Scalp and Hair Concentrate from Kerastase is a specialised leave-in treatment that will have your hair looking and feeling thicker and shinier. Nourishing and conditioning, this Scalp and Hair Concentrate strengthens and thickens hair fibres to leave your locks more resistant to breakage. Helping to increase hair resistance to breakage by up to 93%, this Initialiste Advanced Scalp and Hair Concentrate is your answer to hair that is in need of some TLC. With fast, noticeable results this ingenious formula will transform your locks and have hair looking healthier than ever before. 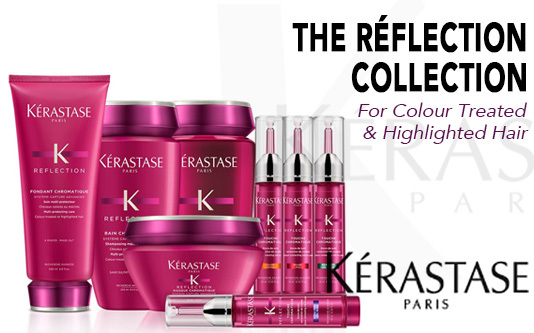 Introducting the newly-formulated Kerastase In Salon Rituals. In Salon Rituals are hair conditioning treatments that are professionally prescribed to meet every need of your hair. They are concentrated and in the purest form to target your hair problems. They will improve damaged and weak hair, colored hair, dry hair, frizzy hair, dull hair, life-stressed hair that lacks density, and so much more. There are 20 unique combinations that can be formulated to give you the utmost personalized hair care. My favorite thing about Kerastases in salon treatments is that they are A permanent fix. THe more you use the, the better your hair will be come. Its not a bandage for bad hair, they are instantly transforming your hair. 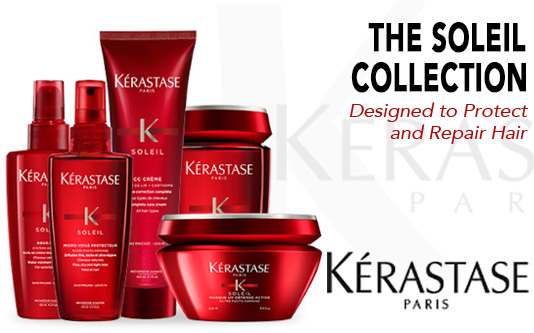 Kérastase Soleil Collection is a light-reflecting haircare product line that gives colour-treated hair long-lasting radiance and intense, mirror-like shine! Kérastase created a customized 3-step beauty routine: cleanse, treat and texturize with carefully-conceived methods for beautifying the hair. 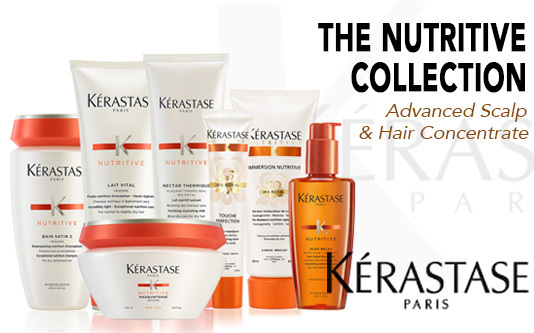 Spécifique, Kérastase Nutritive Gluco Active is the hair care solution for normal to dry hair. The 3-step routine provides optimal nutrition to the hair to restore moisture and shine. Cleanse with Bain Satin 1 shampoo for normal to slightly dry hair or Bain Satin 2 shampoo for extremely dry hair. Treat using Lait Vital daily conditioner. For a more intense nourishing treatment, use Masquintense 1-2 times per week. Prime hair with Nectar Thermique to protect from heat damage and leave style with high-shine. PROTECT, REPAIR, BEAUTIFY. THE ULTIMATE SOLAR PERFECTION FOR HAIR. 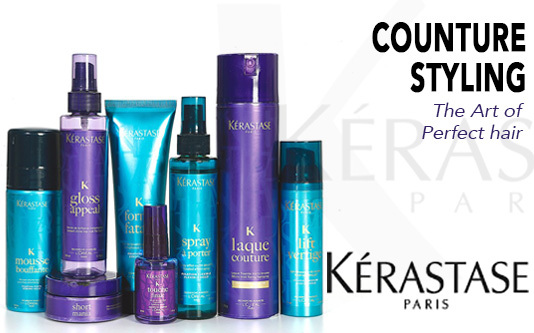 25 years of expertise in hair protection and beauty under the sun. The winning trio of a shampoo, a mask, and a CC crème to protect, reinforce, nourish, style and illuminate the hair. Caring for the scalp along with nourishing, protecting and enhancing the hair is the Kérastase approach to the “Art of Perfect Hair”. Volume, shine and movement all start with high-performance products followed by personalised hairstyling. Neutral Bay, NSW 2089 Australia. I’ve been seeing Anthony for 2 years now, having first arrived in his salon crying hysterically, having experienced the devastating effects of another companies hair extensions. Since then, I've had the Hair Extensions that Anthony uses and have been overwhelmed with the quality and the results..."